All of our buildings are bespoke and custom built, nothing is built on jigs and therefore all the designs are fully customisable in regards to door and window layout at no extra cost to the customer, also dimensions can be altered to make the most out of even the tightest spaces. 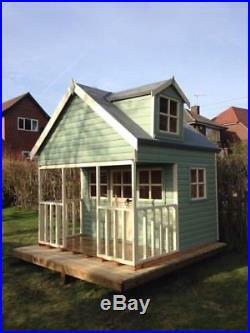 This 7ft by 7ft Wendy house is built on all 2 x 2 framing, spaced at approx 600mm centres on the walls and roof of the building and approx 400mm centres on the floor. The walls cladded in 23mm finish log effect tongue and groove (T&G) with 20mm finish T&G floor boarding. The roof is boarded with a 14mm finish T&G. A polyester felt is used as standard on all of our work and offers upto 15 years protection. No ply wood or chip board is used in the construction of the build. With this building the doors and windows fit with styrene plastic for safety. Outside is given three hand brushed coats of cuprinol garden shades (colour scheme of your choosing) and this allows for 5 years protection in between future coats. The item "7tt X 7ft Wendy House Kids Den Play Area Childs Summer House" is in sale since Sunday, April 1, 2018. This item is in the category "Toys & Games\Outdoor Toys & Activities\Playhouses". The seller is "valleytimber" and is located in Belper. This item can be shipped to United Kingdom.